Meat-free Monday, accompanied by the ubiquitous hashtag, is having a bit of a moment. Despite my carnivorous tendencies I am guilty of hopping on the bandwagon and championing chickpeas over chicken wings as a smug start to each week! This utopian plant-based way of eating can be wonderful but the reality is the carnivore within sometimes needs to be satiated. I found myself craving a little indulgence, a yang to the ying of the previous day’s virtue…so with the firm objective of rewarding that good work my friend and I declared it to be Treat Yourself Tuesday and headed hungrily to Asador on Haddington Road. The word Asador, Spanish for a traditional wood-fired grill or spit, for me conjures up images of a rustic Old World-inspired eatery. While the bespoke grill plays the central role in the open stage that is the kitchen, I was pleasantly surprised to discover that the décor was sophisticated and sleek with a neutral colour palate and invitingly plush cream leather booths. One thing is certain, this place is no-one’s meat wagon. A crowd of suited and booted apres-work diners seemed to be enjoying the buzzy atmosphere as Rachel and I settled in to the best booth in the house, with a cracking view of the confident chefs at work in what must be a very hot kitchen indeed. The seductive scent of flame engulfing meat began to build anticipation and we were rearing to get stuck in to the menu. Keen to fit my fix of creamy cheese into my night of indulgence I decided to start with Salt Baked Heirloom Beetroot with Ardsallagh Goat’s cheese and Orange Pistachio dressing, which strewn on slate popped nicely, a colourful kaleidoscope of a dish. I wondered how satisfying such a simple combination could be but the salty nuggets of goat’s cheese played with the sweet, fork tender baked beets beautifully. The dish was pulled together by its deliciously sharp, punchy orange dressing, blood orange perhaps? Finally, the pistachios proved to be a more interesting nutty bedfellow than the usual walnut pairing and a subtle but delightful nod to the Spanish theme. Rachel opted for the more classically Latino offering of Prawns Pil Pil, which were plump, succulent and bathed in lip-smacking garlic and chilli oil with a satisfying after-burn which the side of ciabatta drank up greedily. All in all a good start, but we were eager to sample Asador’s signature flamed offerings by main course. An expansive list of mains from flame-kissed lamb hangman or barbacoa chicken to a light fish of the day pairing of grilled cod with grapefruit and tarragon all sounded promising. On another night, virtue intact, the veggie option of carrot and sesame burger with avocado and yogurt sauce may have tempted me. Not tonight, love. The meatiest of offerings in the form of several choice cuts of beef had my undivided attention. The usual suspects of rib eye, fillet and striploin considered, I decided I had to get my hands on 8 ounces of the more unusual and most prized Argentine cut of Picanha (think slightly marbled accent confirming ‘Pecan, yeah?’). 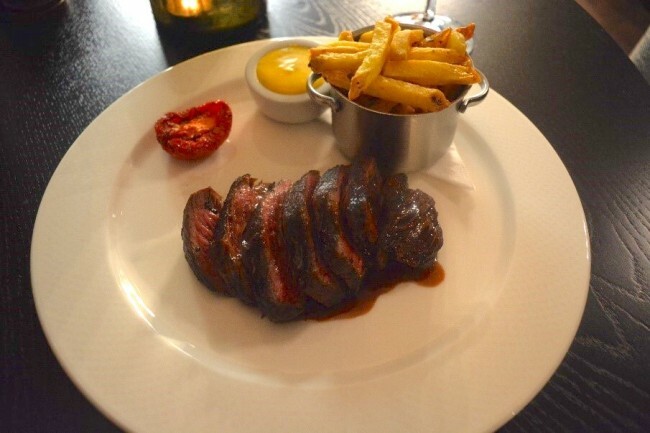 So named after the searing hot poker used to brandish cattle, X marks the spot of a seriously scrumptious cut from the rump cap which sacrifices no flavour on the altar of tenderness, as other cuts such as fillet sometimes do. Cooked black and blue, that is as Nigella would say, with a charred crust and quiveringly ruby rare within, this was the perfect showcase of the mouth-watering effects of open flame cooking over maple and hickory wood chips. Things were getting primal. My choice of a silky and interestingly smoked béarnaise was a match made in heaven and heightened the flame-grilled flavour as well as texturally mimicking the melting interior of the Picanha. My conscience had suggested a rocket and parmesan side salad but the luscious béarnaise demanded Asador fries and who was I to deny it? 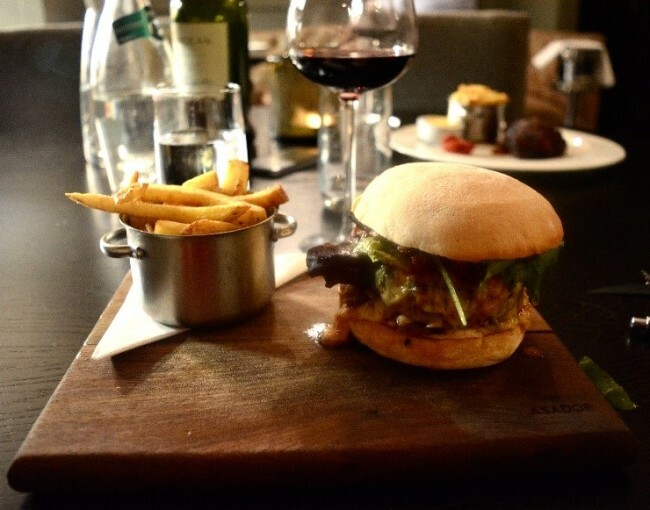 I begrudgingly agreed to share a sliver of my dish, to be honest, only to secure the right to dig in to the Asador Burger in return. Rachel agreed, this steak was indeed something special. The prospect of a juicy medium burger fresh out of the flames, piled high with lashings of melting cheddar could evoke a craving in most people. I found myself staring at the glistening coating of cheese, transfixed, thinking if food could have ‘come to bed eyes’ this burger would be making serious advances at me! The ratio of cheese to meat at first blush seemed extravagant but was a burger ever ruined by the addition of too much cheese? I think not. The spice of Jerk mayo and deliciously sweet caramelised red onions cut across this richness perfectly. This was a seriously drool-worthy classic which was simple, well executed and consequently devoured. Committed to keeping the Latino thread running through the meal, we enjoyed a bottle of darkly delicious Mendoza Malbec which lived up to its billing as ‘unashamedly mouth-filling’ and proved more than capable of standing up to the bold and dominant flavours of both our main courses. By the time dessert rolled around I thought I might have to be rolled out myself, but as it was Treat Yourself Tuesday we soldiered on like troopers. 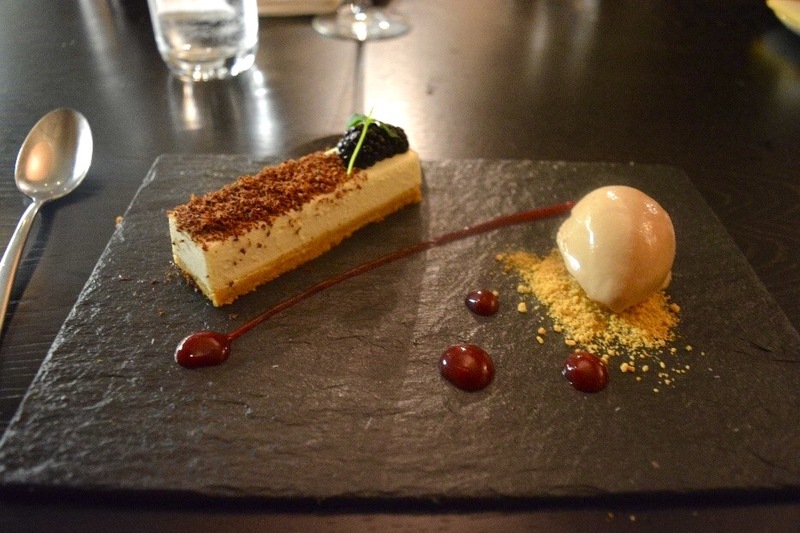 We shared a Lime Cheesecake with Milk Chocolate Ice Cream and Blackcurrant and a Chocolate Espresso Mousse with Sables and were both rather glad we didn’t opt to skip dessert. As an 85% cocoa solids kind of girl I was surprised to discover my favourite element out of both dessert choices was the milk chocolate ice cream, which was almost malty in its creamy, dreamy dairy deliciousness. 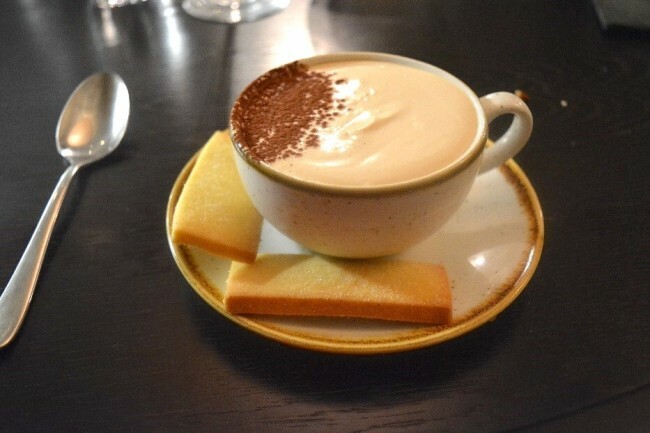 It felt like a quenelle of comfort and I could happily have eaten goblets full of it. Similarly, the sugar-dusted sable accompanying the chocolate mousse was the stand out feature of that dish and must have been the work of a talented and cool-handed baker. Crumbly and meltingly buttery, these sables were the perfect vessels for scooping up the sinfully dark, mouth-enveloping mocha mousse. As our thoroughly enjoyable dinner drew to a close we concluded happily that Treat Yourself Tuesday at Asador was a roaring success. As the home of one the best steaks I have eaten in Dublin to date I will undoubtedly find myself there again when the mood takes me. Even if I am slightly fearful that I may order a Cote de Boeuf and refuse to share. My parting advice on Asador? Come hungry and come often. Growing up with a name like Darina, I rarely met anyone who could resist asking if I could cook like my namesake. With that (and greed) as the ultimate motivators, tinkering with recipes in the kitchen became my favourite way to spend a day. I quickly realised that home-baked goods made excellent bribes and an obsession was born! Earning bachelor’s and master’s degrees in law led me to undertake a PhD, but the niggling feeling of preferring cookbooks to textbooks persisted. Having become a (self-confessed!) demon in the kitchen, I am the only person to have contested both Masterchef and the Great Irish Bake off, both of which fuelled my desire to set my focus on food in a serious way. Working with The Taste is the perfect way to satiate this craving and marries my food fascination with my love of writing and ranting. Follow me as I document and share my food adventures, both in Ireland and abroad, and hopefully inspire others to indulge their passion for cooking and food in the process.